The other night, Blake made pasta for dinner. When I was just about to finish my bowl off, I noticed this amazing noodle. Blake promised me that he didn't do it and it certainly didn't come out of the box like this. Wow! It blows my mind just thinking about how it got like this. That's really cool! You're so observant, Lindsey! You know what they say...given infinite time and paper, monkey + typewriter = complete works of Shakespeare. 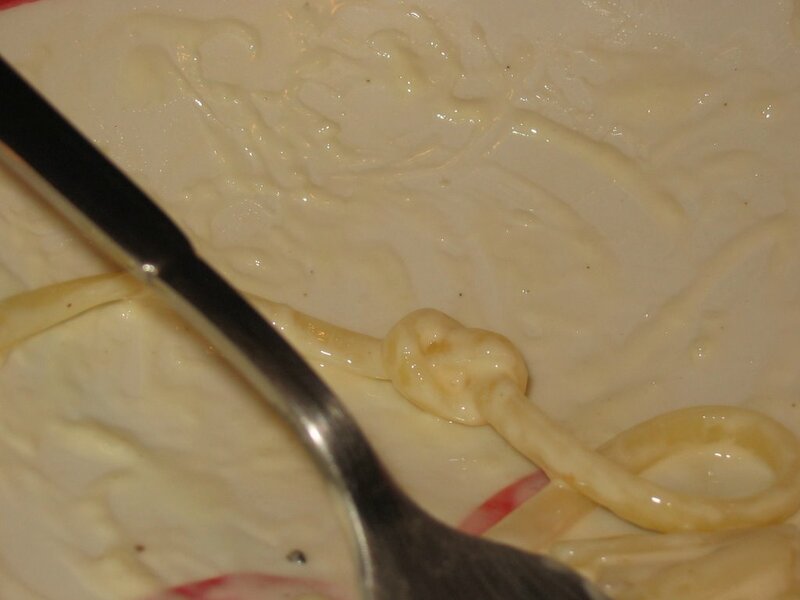 Similarly, given enough time and Alfredo Sauce, Blake + pasta = halfhitch knot. Seriously though, that's just randomness expressed in simple carbohydrate form. Sooner or later it was going to happen.